Downtown Dental Group was founded on the belief that every patient should be well informed about their oral health and use that knowledge to make decisions about their care. Located in Manhattan, Kansas, we are proud to serve the Little Apple and neighboring communities like the families stationed at Fort Riley, and the students at Kansas State University. Your family’s oral health is important to us, so we have created a guide for how to maintain optimal oral health! 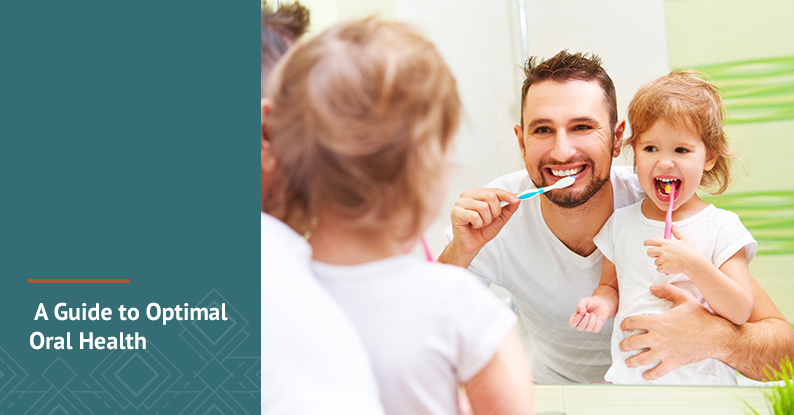 Brushing your teeth is one of the foundations for achieving optimal oral health. You should brush your teeth twice a day, and most importantly before you go to bed. Be sure to use a soft bristled brush, as some of the more stiff bristles can actually cause damage to your gums. Most dentists recommend using a fluoride-based toothpaste. Correct brushing technique is important as well. Make sure your toothbrush is angled to reach where your teeth and gums meet. Use short back-and-forth motions to ensure the toothbrush is cleaning all the plaque and tartar out of your teeth. Electric toothbrushes are ideal for the best clean. A step that is commonly missed is to brush your tongue. This helps rid of “bad-breath” germs and ensures that your whole mouth gets cleaned during the brushing. Be sure to rinse your toothbrush when you are done, and replace your toothbrush every 3 months and after each time you get sick. If you struggle to hold floss this way, you can also use pre-threaded flossers. Flossing is one of the best ways to prevent cavities between your teeth, clear plaque and food build up between your teeth, and prevent gum disease. To maintain optimal oral health, you should be mindful about what you eat. Eating a healthy diet will help prevent dental issues like cavities and gum disease. Avoid sugary foods and drinks, especially at night or before you go to bed. If you brush your teeth right after drinking a sugary soda, you are likely rubbing the sugar into your teeth. A healthy diet is also important to your gum health because there is a link between Type II Diabetes and periodontal disease. Maintaining a healthy weight, and blood sugar levels will help you prevent unwanted gum disease. Aside from regular at home care of your oral health and eating a healthy diet, you should also be sure to have regular dental check-ups and cleanings. It is recommended that you get a dental cleaning every 6 months to remove tartar you can’t get rid of with regular brushing and flossing. Dental check-ups are also time to make sure any problems are caught and addressed early on. It’s never too early to see the dentist and if you have children, bring them in as soon as they get their first tooth. At Downtown Dental Group, we want our community members in the Manhattan, Kansas area to be educated about how to achieve optimal oral health. Schedule your bi-annual appointment today by calling 785.776.0097 or by submitting an appointment request at the top of the page!